Today, AMD is launching a new mid-range graphics card, the Radeon R9 380X. Said to target beyond 1080p gaming, it's going to be positioned between the GTX 960 and GTX 970 in terms of performance. In theory this isn't a bad idea, as that's a wide gap that Nvidia itself so far hasn't sought to fill, although in practice it won't be in the middle of two but closer to the GTX 960. Still, this isn't a bad thing in and of itself as long as AMD and its partners can get the pricing right, which is ultimately what we're here to evaluate. Price-performance is everything in the mid-range and two of the cards either side of it, the R9 380 and GTX 970, are pretty strong in this aspect right now, so the R9 380X certainly has its work cut out. In terms of upgrades, AMD claims the R9 380X will offer GTX 660 and Radeon HD 7850 owners approximately double their current performance. Basic models are set to start at around £185, with overclocked models beginning at £190. The GTX 960 and R9 380 both start at around £150, with 4GB SKUs retailing closer to £170, while both the cards above it, the R9 390 and GTX 970 occupy a significantly higher price bracket starting at £250 or so. Back in 2011, the Radeon HD 7970 and HD 7950 were the top end GPUs (called Tahiti) based on AMD's first generation Graphics Core Next architecture. These were later rebranded as the R9 280X and R9 280 respectively. 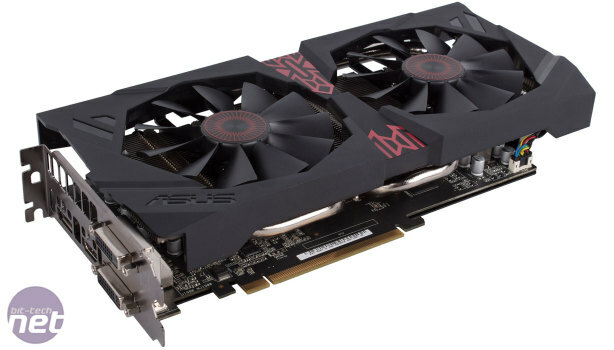 Following that, AMD released the R9 285, which had many of the same core specifications as the R9 280 but was built on a new layout using what AMD calls its third generation GCN architecture but is also often referred to as GCN 1.2. This new GPU was called Tonga, but until now we've not seen a product use a fully enabled version of it – there was no R9 285X, with the R9 285 instead being rebranded as the R9 380 (with a clockspeed bump and a 4GB SKU made available). To add a little more confusion, AMD also rebranded the GPU as Antigua. In short, the R9 380X uses a fully enabled Antigua (Tonga) GPU, giving it the same core count as the R9 280X and HD 7970 of yesteryear but with a different layout and a few tweaks that impact performance and features. The block diagram we have is simply a quick and dirty Photoshop job based on an earlier Hawaii one, but it's enough to show what's going on at the high level. 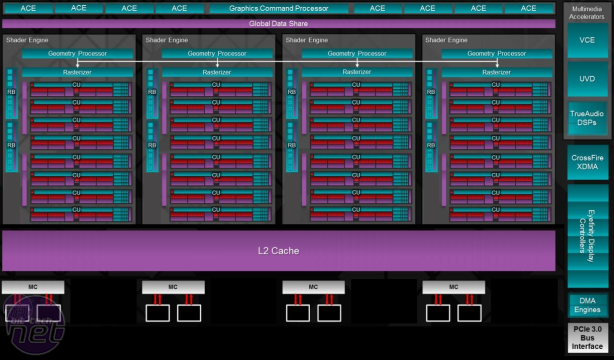 The fully enabled GPU has the standard front end with eight Asynchronous Compute Engines as well as the global Graphics Command Processor. It's then divided into four Shader Engines, each with its own tesselation and geometry hardware. There are also eight Compute Units per Shader Engine – this adds up to 32, which gives the R9 380X its 2,048 stream processors and 128 texture units (a 14 percent bump over the R9 380). 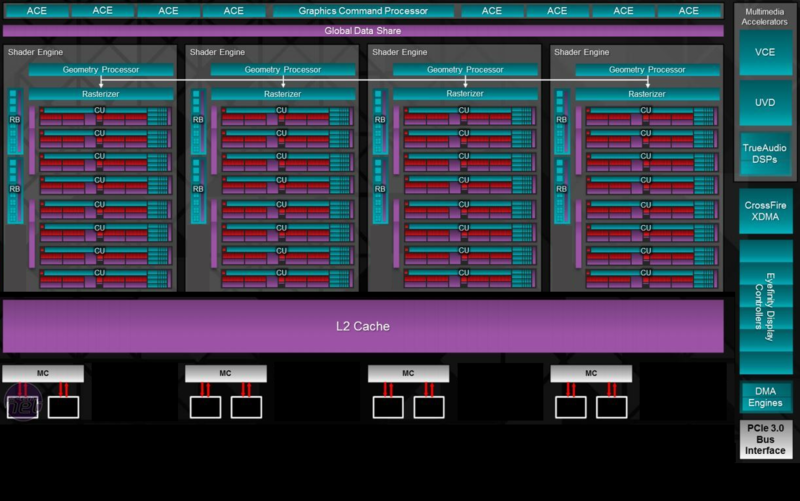 Lastly, each Shader Engine has two Render Backend units, giving us a grand total of 32 ROPs. The reference clock speed is 970MHz, the same as the R9 380, though as with other R9 300 series cards we can expect board partners to ship their parts with small bumps to this. Other than the added cores, this is the same as the R9 380. Four memory controllers add up to a 256-bit interface, which the R9 380X uses to communicate with its 4GB of GDDR5 (there are no 2GB SKUs). With a memory clock speed of 1.425GHz (5.7GHz effective) we have a total memory bandwidth of 182.4GB/sec. AMD doesn't specify the true TDP or power limit of its graphics cards, instead giving a rating called Typical Board Power. Either way, this is the same as the R9 380 too: 190W. The maximum the card can draw through its dual 6-pin PCI-E power connectors and the PCI-E lanes is around 225W. As mentioned, the R9 380X uses GCN 1.2, which includes lossless compression of colour data in the frame buffer, thus making more efficient use of the available bandwidth. It also uses AMD's latest display controllers and video encode/decode blocks, though sadly these do not include HDMI 2.0 or hardware-level H.265 support. The R9 380X also supports CrossFire directly over the PCI-E bus with no need for an additional connector. Other features include FreeSync, Virtual Super Resolution, which essentially renders a game at a higher resolution than your monitor before downscaling it for extra detail and less aliasing, and Frame Rate Target Control, which lets you limit your frame rate in order to reduce power, heat and noise. Both DirectX 12 and the Vulcan API are supported, with AMD highlighting that its ACEs give the GPU hardware-accelerated support for asynchronous shaders, a DX12 feature that allows you to process graphics and compute tasks simultaneously. No word on compensation, though.